Keeping up with the latest trends is an important business task. It always pays to be on the leading edge of what’s happening the world of sublimation, rather than lagging behind and missing out on opportunities for sales. Here are some trends that you will want to cash in on in 2015. Sublimated socks started as somewhat of an oddity in 2014, but quickly became a very viable product, as the consumer retail marketplace was already teeming with decorated socks, thanks to companies like NIKE. With the upswing in demand for these very profitable items in the sublimation world, we like this product as one of the top trends in 2015. Sock sublimation is relatively easy and can be accomplished with any sublimation printer from the Ricoh SG 3110DN on up. The key is to source socks that are designed for sublimation, as these will ensure the best imaging and most vibrant colors. You will also need a jig designed to support the sock during pressing. This can be obtained from any sublimation dealer that sells socks for sublimation. The demand for large prints on t-shirts is on the rise, and will be a solid trend in 2015. Images from 12” x 12” up to 12” x 18” have become the norm in the apparel decoration marketplace, bringing plenty of opportunities for sublimators who have larger printers, such as the Ricoh SG 7100DN. A key benefit of larger apparel prints is that the cost is extremely low (sublimation ink costs averaging less than $0.01 per square inch), yet the perceived value is high, which translates into robust margins. All-over and cut-and-sew sublimation printing are also rapidly expanding and will continue to do so in 2015. 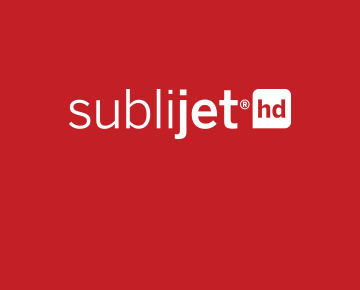 The SubliJet E-Professional series offer several printers that are ideal for all-over sublimation production. Personalization has long been associated with consumer gifts, but a recently it is showing up in the corporate marketplace on promotional products. This is a unique trend that is in its early stages with a lot of room for growth. Promotional products are important advertising tools for big and small companies the world over. The concept is that they give out items to their customers and/or potential clients that are imprinted with their logo and/or business name. In return, they get exposure for their brand identity. However, this only works if the product is seen by a large audience. One popular promotional product is the sublimated coffee mug. It’s relatively low in cost, and typically gets used by the recipient in a business environment, so that hopefully it achieves the goal of visibility for the brand imprinted on it. But that only happens if the recipient actually uses the mug routinely. The best way to ensure that this happens is to personalize it with their name, which is almost a 100% guarantee that it will be their mug-of-choice – which in turn garners the desired exposure for the brand on the mug. In terms of sublimation, adding a name under a logo is virtually free in terms of cost, but very valuable in terms of perception. Sublimators can use this approach to increase margins while keeping costs the same.